Smithereens Lead Singer Pat DiNizio Dies At Age 62 : The Two-Way Pat DiNizio, a singer and songwriter who made popular rock songs as the leader of The Smithereens, died on Tuesday, his fellow band members say. Pat DiNizio, leader of The Smithereens, died on Tuesday. He's seen here singing during the band's 2003 performance at Rockefeller Center in New York City. 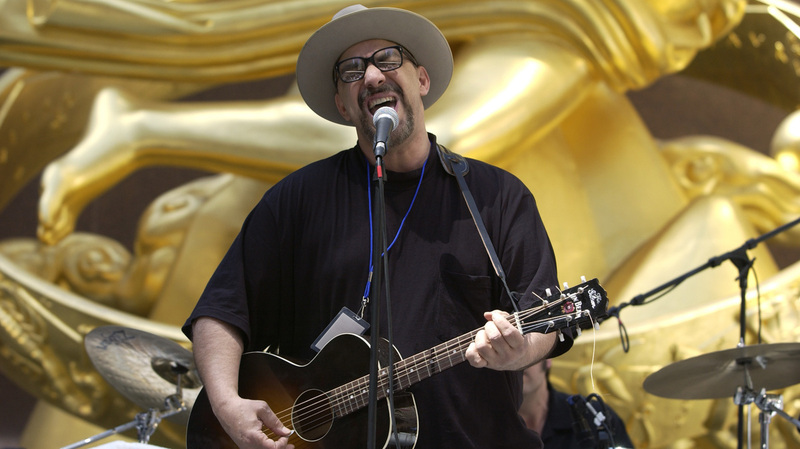 Pat DiNizio, a singer and songwriter who made popular rock songs as the leader of The Smithereens, died on Tuesday at age 62, his fellow band members say. No cause of death was provided. "Today we mourn the loss of our friend, brother and bandmate Pat DiNizio," said DiNizio's fellow Smithereens Jim Babjak, Dennis Diken, and Mike Mesaros, in a Facebook posting that echoed one on Diken's account. The Smithereens and DiNizio had a string of hit songs that have persisted among rock fans, from "A Girl Like You" and "Behind The Wall Of Sleep" to "Only a Memory" and "Blood and Roses." "Pat had the magic touch," DiNizio's bandmates said. "He channeled the essence of joy and heartbreak into hook-laden three minute pop songs, infused with a lifelong passion for rock & roll." The Smithereens were founded in Carteret, N.J., in 1980. They released their first full album, Especially for You, in 1986 — after DiNizio sent a cassette tape of their music to Enigma Records to help net a record deal, according to the band's website. A number of musicians have sent their condolences and appreciations to the band, among them R.E.M. 's Mike Mills, who wrote, " Very sad to hear of the passing of Pat DiNizio. Always enjoyed speaking with him and hearing him play." The Smithereens had a particularly big influence in New Jersey, their home turf and a place they always embraced. Today, DiNizio's fellow Jersey native musician Ted Leo wrote, "Aw, man. Knowing that The Smithereens were a staple at my hometown's Dirt Club early on, actually helped me understand that good songs, hard work, and a love of playing music can be a path to making some kind of life out of it." Despite solo projects by DiNizio, the band had remained active through the years. In 2011, they put out their first new album in a decade; they were planning to go on tour in January, touting their nickname: "America's band." In their note about DiNizio, his bandmates added, "Our journey with Pat was long, storied and a hell of a lot of fun. We grew up together. Little did we know that we wouldn't grow old together."